QR codes are a relatively new technology. This means that it is natural for some people to get them wrong. 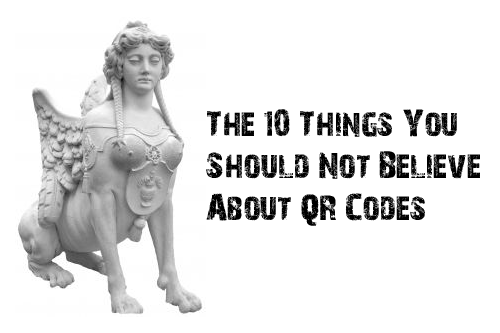 Read on to find out some common misconceptions about these very useful 2D barcodes. 5. QR codes can be inverted. In the early days of the QR code, some people tried to invert them to make them appear different. The black parts of the code are rendered in white and vice versa. People cannot scan it successfully. The simple truth is that you cannot invert a QR code. Not everyone is using a QR code scanner application that would be able to invert the QR code when it is scanned. If you want to change colors, make sure that the black part has a darker shade than the white part. Also, make sure that there is enough contrast between the two colors that you choose to ensure that the QR code would still work. 6. QR codes are only able to handle Web site URLs. Some people think that you can only use QR codes to direct people to your Web site or a special site that is specific to your campaign. This may be because most marketers put Web site URLs behind their QR codes. The truth is, you can put videos, audio files, text messages, e-mail messages, contact and just about any type of text behind a QR code. 7. You cannot use a QR code if you do not have a Wi-Fi or mobile data connection. One of the most frequent examples of QR code fails is when a marketer puts up a QR code in an area where there is no Internet connection or no mobile signal. While it makes sense to have ready Internet connection if you are planning to take customers online, a good QR code scanner application will be able to save the URLs you get from the QR code. This will enable you to visit the URL later.